1. Last month we reached and passed the 10.000 unique visitors per month at our website! 2. Interesting article at our next month’s issue: DANCING FROM THE HEART, BY JESSICA WALKER. 1. Last month we reached and passed the 10.000 unique visitors per month at our website. I want to share and celebrate this small event with you, because contemporary-dance.org is growing thanks to the support and active participation of you all. I also want to profit the occasion to remember everyone that contemporary-dance.org is a public website of free use and it will continue being like that, in order for you to profit from its wide communication with the rest of the world. If you are new at contemporary-dance.org, find the different ways in which you can use and make profit of our website (from posting news and asking questions to publishing pictures, videos or articles) just above, in the section entitled ‘Important Notices’. As always, please feel yourself at home. You’re at contemporary-dance.org! 2. Interesting article at our next month’s issue: DANCING FROM THE HEART, BY JESSICA WALKER. I’ll send you the transcription of an interview with her. You will find the main ideas of her teachings on reaching a different level of expressivity. I keep translating some of the most popular pages of our website, but there’s also new material in English on the way. You’ll see! A few weeks ago, I was commissioned to create a Flash Mob for a public event in my home town. When discussing with the working group of the project, everybody was asking: we are going to do a what? Yes, a Flash Mob, we answered, or a Flashmob, if you prefer; I guess the expression hasn’t been classified into the official records of the English language yet. Well, not only the living arts family has this kind of 5 years old baby now (maybe more but I don’t really know), but we seem to be going through the era and kingdom of it. You can verify it yourself. 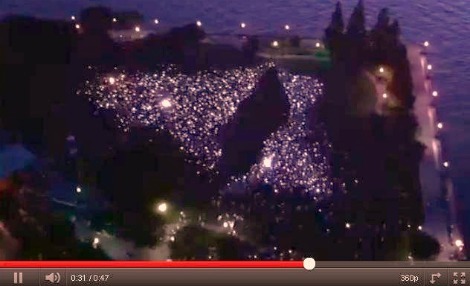 Just type down ‘Flash Mobs’ at YouTube and you will see the results… they’re endless. After the famous T-mobile dance ad, which is a huge and fantastic fiction, you will find a looong list of assorted Flash Mobs: there are loud Flash Mobs, quiet Flash Mobs, danced Flash Mobs, sung and danced -musical-type- Flash Mobs, acted or performed Flash Mobs (like the legendary frozen in the Grand Central Station), hi-tech Flash Mobs, Flash Mobs for marketing, Flash Mobs for protests, Flash Mobs for weddings, folk-type Flash Mobs (based on folk dances or traditions), and the height of it…: Flash Mob, the movie! 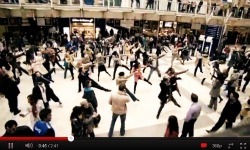 You might agree with me now… this last five years have been kind of the era of the Flash Mob. It is curious to see how a new concept can motivate and mobilize crowds out of just a new few ingredients. And I say new ingredients, because we all know that the living arts (i.e. contemporary dance, theater, some forms of visual arts and so forth) have been doing similar things for decades, but it is only now that this particular type of performance has gained the interest of crowds to the point of being reproduced massively. The Flash Mob seems to be like a relative of a standard performance in outdoor and public places. Though, as it names expresses, it has two main particular features: it happens quickly (Flash) and there’s a big bunch of people involved (Mob). - It is a popular event. Though specialized dancers or performers are usually implicated, the majority of Flash Mobs include all kind of non specialized performers (i.e. normal daily people). - It makes something unusual and catching to happen. Well, that’s the ideal… but as Flash Mobs have become so common, they tend to not be so unusual anymore. And concerning the ‘catching’ thing, well it is a very important part, but it happens in reality in a very subtle way (if it does…). For the concern of the dance community, it is a fact that the most reproduced type of Flash Mobs is the danced one. That’s why I decided to write something about it at our e-zine, because it might be of interest for us, among contemporary dancers. Why would that be of our concern? Because the phenomenon of the massive danced Flash Mob is a huge prove of the fact that people ADORE AND LOVE TO DANCE. It is such a touching reality to see so many workers coming out of their offices, tills, cabs and sedentary jobs to dance together and have a flashy moment of joy and happiness. Off course, the reality of what is happening out there is not like an ‘Alice in Wonderland’ story. The greatest Flash Mobs we see on the web are done through mega productions that create fictions. The T-mobile dance, for example, was done with 400 people, out of 10000 that auditioned, overnight rehearsals, ten hidden cameras at the event, etc., etc. Who cares, if we’re having fun! Yes, I would say so too. Where did we leave the crowds, the unusual character and the creative part of it? Why are so many choosing to dance to ‘I’ve gotta feeling’ from the Black Eyed Peas? How come you are doing a Flash Mob and there’s already a big audience at the hall waiting for it to begin? Why is everybody ‘freezing’ worldwide…? Don’t we have original ideas? In that sense, I think that the work of the guys from ImprovEverywhere is really remarkable. Not only they’ve produced many original ideas, but they have affirmed the notion of the ‘undercover agents’ (instead of dancers or performers), and the ‘mission’, which emphasizes the fact that something has some kind of a hidden character. But again, maybe the fact that people enjoy repeating what others have proposed as an original event is not a big deal. This is allowing hundreds of non dancers to have the experience. And that, I believe is good for humanity. Amazing. I really think it is amazing. So, Flash Mobs… would you like to join in?